Two sets of stairs, each with 89 steps representing Chaing Kai-shek’s age when he died, lead to the main entrance of the Memorial Hall. Rising 289 feet above ground and covered in glazed tile, the structure and surrounding flower beds represent the colors of the flag of the Republic of China. Chaing Kai-shek retreated from China to Taiwan with his army in 1946 following defeat at the hands of the Communists. He had been ruling China for nearly twenty-two years. After arriving in Taiwan, he served as President of the Republic of Taiwan until his death in 1975. During the period of his rule, he continued to develop plans to retake mainland China from the Communists. Following his death, the Memorial Hall was erected in his honor and has become a natural gathering place, landmark and tourist attraction. If you visit Taiwan, don’t miss it. I was impressed. 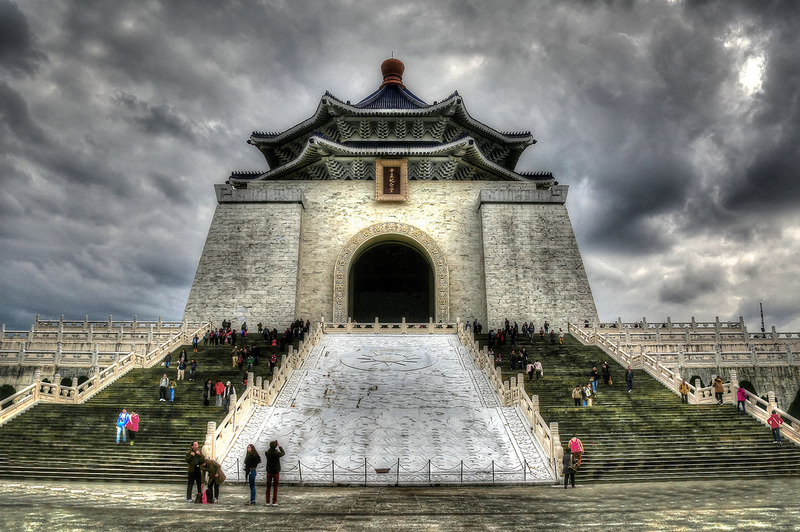 Erected in honor of former President of the Republic of China, Chaing Kai-shek, the Chaing Kai-shek Memorial Hall is a famous monument, landmark and tourist attraction in Taipei, Taiwan. Beautiful and amazing! I would like to go there someday.